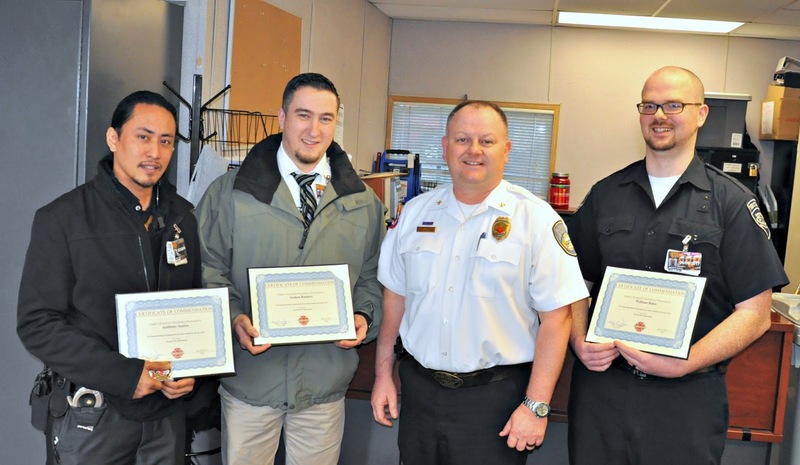 Medical Services Officer Mike Newhouse awarded Certificates of Commendation to Emerald Queen Employees Anthony Santos, Joshua Ramsey, William Bales, and William Smith (not pictured) at a special gathering yesterday. The four were recognized for performing CPR and using one of the Casinos Automated External Defibrillators to revive a patron that had suffered sudden cardiac arrest. “Rapid intervention is critical. We are grateful that these four were able to act quickly to save a life,” said Fire Chief Jim Duggan. Information about free CPR classes is available from the Tacoma Fire Department.